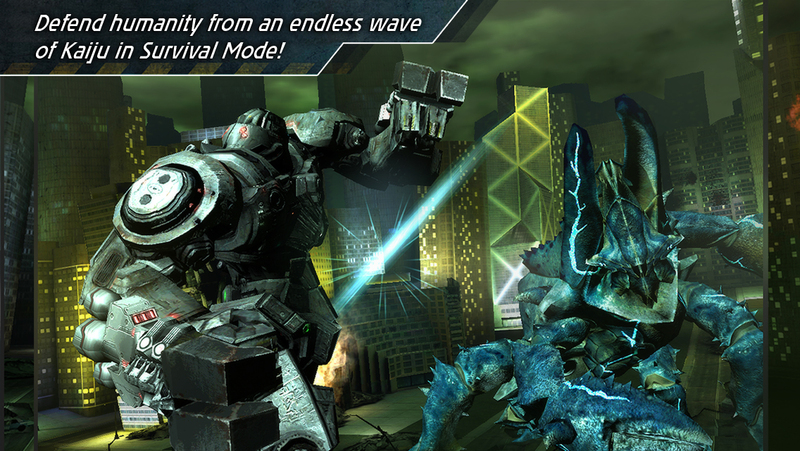 Pacific Rim ($0.99) is a blatant Infinity Blade ($5.99) clone and, unfortunately, not a great one. The game starts you off with a training process in one of the several Jaegers (mechs), though not one I recognized from the film… it could have been in there, as I have the attention span of a flea, but I do remember seeing the other Jaegers that are available for purchase within the game (though one of them, oddly, is missing an appendage). In this Jaeger, you are shown through the basics of dodging, blocking, parrying and attacking, which are done via onscreen buttons for the evasive moves and swipes for the attacks. It’s all fairly straightforward, or at least should be, but the problem is the controls just don’t work as they should. For example, swiping towards the enemy’s attack should trigger a parry, but more often than not the game just ignores the input altogether. Or there is a delay before your Jaeger actually moves, which, I don’t have to tell you is an incredible annoyance in a game that requires super fast flicks and swipes to be able to produce positive results. As well as the sub-par controls, the game doesn’t seem to follow the movie in any way other than chucking a Jaegar in the ring against a Kaiju (monster). A major part of the movie is the whole system of two pilots controlling each mech, and the physical and mental training that the pilots have to go through themselves, including being prepared for the “drift", a kind of mind meld that the pilots undergo to control the Jaegers. There’s really not much of a back story in Pacific Rim, you’re just thrown straight into a Jaegar and sent off on a bunch of highly repetitive missions. And that’s another thing… in the movie, without giving too much away, the Jaegars are never deployed to fight more than two Kaiju at a time… there is quite an important reason for this, as explained in the film, though the game totally disregards it and sends you off on missions against several Kaiju of increasing difficulty, with the aim of what seems to be making you spend your cold hard cash. Which brings me to my next gripe. The IAP system is brutal. Purchasing weapons, upgrades and extra mechs costs a heck of a lot and you’ll only be a few levels in before you pretty much have to pay, as the difficulty ramps up very quickly. Of course, some players will be better than others, but for the majority of us playing through the game without spending anything on IAP just simply isn’t possible, and even if you are a seasoned pro, you will still need to grind away for years to raise enough dough to unlock the new Jaegers (including Gipsy Danger, the hero of the film). Even the projectile weapons need to be kept stocked with ammo, which costs money. Sure, there is a large range of weapons and upgrades from air strikes to nanobots to armor and the Jaegers themselves, but unless you have the bank balance of the producers of the movie, you’ll be stuck with the default Jaegar and perhaps the upgrade to slightly above average armor and a chainsaw, resulting in no further progress. There are some good points. The 3D models of the Jaegers and Kaiju are fairly decent. There are quite a few jagged edges but they are still reasonably impressive and slick enough to get the job done. The sound effects and music are suitably epic and match the film’s style, too. On the other side of that coin, the background graphics are appalling, consisting of large cubes with blurry, low resolution textures as the buildings and the odd badly-implemented fire particle system. Also, at times your Jaeger walks straight through buildings like a ghost. There are also smaller graphical glitches such as the “finish him" text remaining on the screen after you have wiped out a Kaiju… it’s a tiny oversight but these small glitches enforce my view that this game was rushed out the door. Pacific Rim is just another ‘grab the cash and run’ film tie-in. 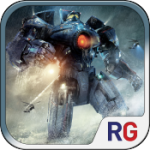 Sure, there is some fun to be had smashing Kaiju about the head but the lackluster controls, mind-numbing repetitiveness, and evil IAP system make this one movie tie-in game that should have well and truly been left on the cutting room floor.